As Rinconcito Sudamericano prepares to end a 28-year run, Rio's d'Sudamerica gets a Peruvian infusion. When Dino Perez was a teenage busboy at Rinconcito Sudamericano, his parents' Peruvian restaurant in Bucktown, he never dreamed that two decades later he'd be running the show. But earlier this month his mother, Elizabeth, moved across Damen to the kitchen of Rio's d'Sudamerica, the Latin American fusion spot he opened in 2006, and helped him create a retooled, mostly Peruvian menu. The transition will be complete after November 15, when Rinconcito closes after 28 years. Now 34, Perez has grown into the family business, and the recent changes have been more gradual than they might seem. "Initially I resented being a busboy and then a waiter," he recalls. "Because of school, I only worked on weekends, which meant I couldn't play sports or hang out with my friends. I wanted to be a baseball player or go into music when I grew up." By the mid-90s, though, business at Rinconcito was booming. Perez's brother Percy (who also waited tables there) had left to run a bar, and Perez, who was studying accounting at DeVry, became the unofficial manager. "It was slow for the first few years, and we relied on the small Peruvian community, but as the neighborhood began improving in 1987 and 1988, our customers became more diverse," he says. "A write-up in Chicago magazine helped, and participating in Taste of Chicago for the first time in 1993 gave us a huge boost. We were the only Peruvian stand and passed out thousands of menus." Mainstays included anticuchos (marinated, skewered beef hearts), papas rellenas (mashed potato balls stuffed with seasoned beef), and ceviches as well as chupe de camarones (shrimp chowder) and other meal-size soups. Entrees ranged from sudado de mariscos (a steamed seafood combination) to aji de gallina (shredded chicken breast in creamy walnut sauce), and prix fixe dinners encouraged novices to try dishes they might otherwise have shied away from. Over the years cooks trained by Elizabeth have gone on to other Peruvian restaurants, taking the recipes with them—a source of both pride and frustration to the family. Another source of frustration was that although Perez's father, Raul, had invested in upgrading the Rinconcito space, at 1954 W. Armitage, the owner was never willing to sell the building. As the area gentrified, the rent went way up. So in 2004, father and son bought a laundromat at 2010 W. Armitage with the intent of moving Rinconcito to that location. But as they tore down the old building and rebuilt from scratch for close to $1 million, a new plan evolved. "The design we worked out with the architect was so modern—with high ceilings and murals—we decided to go with a more upscale, somewhat trendier concept," Perez says. Scouting in Lima, Peru, through a cousin who lives there, he found chef Jose Victtorio, a culinary school graduate who helped develop the menu of Argentine, Brazilian, and Peruvian specialties and Latin fusion creations. Rio's d'Sudamerica opened with everything from moqueca de pescado (Brazilian-style halibut steamed in coconut milk) to parillada (an Argentine mixed grill) on the menu, though even in this incarnation 40 to 50 percent of the lineup came from Rinconcito. "We did pretty well from the start, but I discovered I wasn't a big fan of fusion," Perez says. "The chef kept convincing me to try new things, but I preferred going with what works, and we made changes along the way." More important, he realized that Rio's didn't have a clear identity and actually was competing with Rinconcito. "People were confused because of their proximity to each other, so bringing both operations under one roof seemed like the best solution," he says. "Plus my dad was fed up with his landlord and ready to retire." Perez's mother, on the other hand, wasn't ready yet. On weekends Elizabeth now joins Victtorio in the Rio's kitchen full-time. Besides adding more Peruvian items directly from Rinconcito's menu—among them the sudado de mariscos and carapulcra (pork and sun-dried potatoes cooked in red wine with peanuts and panca chiles)—she's tweaked others, for example preparing seco de carne (meat stew) with beef or veal rather than lamb and substituting seafood for tripe in cau cau spiced with aji amarillo (hot yellow peppers). In addition, Rio's is showcasing a new signature dish, pollo a la brasa, chicken marinated for at least 24 hours in a secret blend of 20 ingredients, then rotisseried in a wood-burning brick oven and served with french fries and avocado salad. "My mom has had the recipe for years but never made it at Rinconcito because building the rotisserie was too hard," Perez says. "I wanted to do something a little different, and after traveling to New York and Los Angeles and seeing how popular [Latin-style rotisserie] chicken is, I decided this would be perfect." The only marinade ingredient he'll reveal: soy sauce. The Nikkei, one of two new ceviches, also reflects the influence of Asian immigrants in Peru; it's a choice of seafood marinated in soy sauce, ginger, and sesame seeds. The other newcomer is the estilo Rio's, with lime juice, coconut milk, ginger, cilantro, and more seasonings. The classico and con crema de ajies (a Lima specialty with rocoto and aji amarillo peppers) ceviches are still on the menu; gone are some of the steaks, the grilled chicken, and the ravioli. 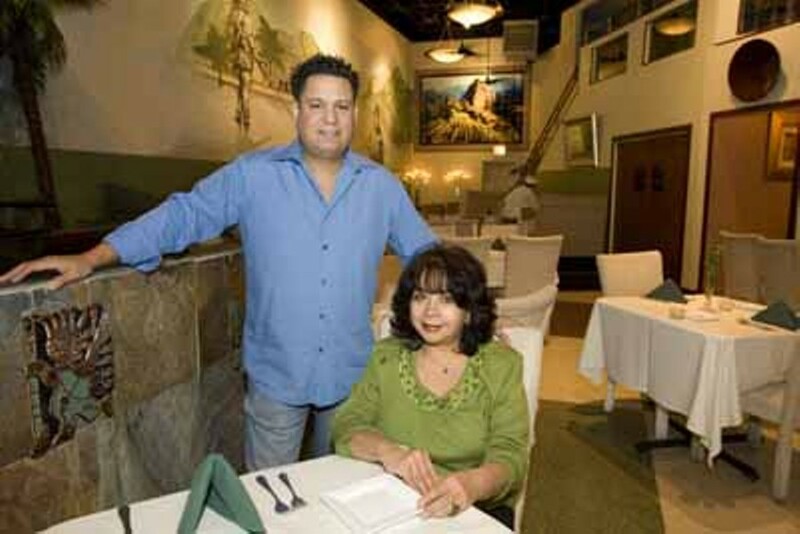 "The dinnerware and plate presentations are more refined than Rinconcito's, too, but the prices are roughly the same," Perez says, adding that Rio's will open for lunch after Rinconcito closes. Care to comment? Find this story at chicagoreader.com. And for more on food and drink, see our blog the Food Chain.